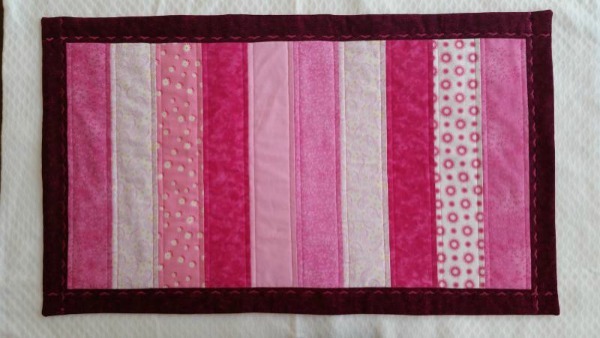 It’s week 3 here at the Quilting Bee, and I have promised to show you some absolutely fun, straight-line, machine quilting. And it looks spectacular, to boot! 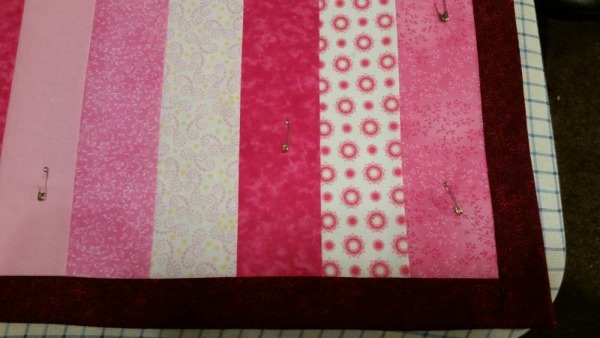 By now, you have sewn the back, front, and flannel lining together, turned this inside-out, given the quilt a good press, and added a few safety pins to help hold everything together. (Questions about any of these steps? Click here to go to last week’s post.) Your quilt should look somewhat like the one in the photo below. 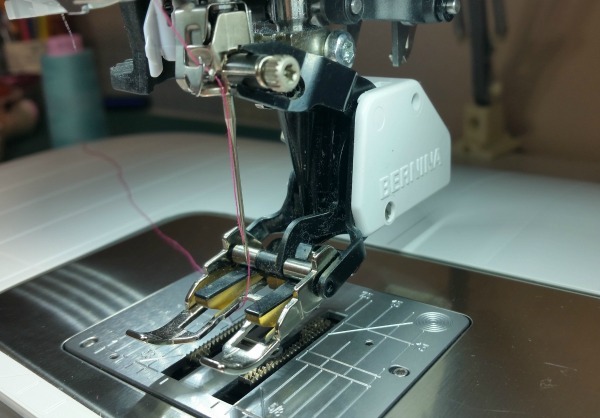 If you have a walking foot for your sewing machine, use it now. 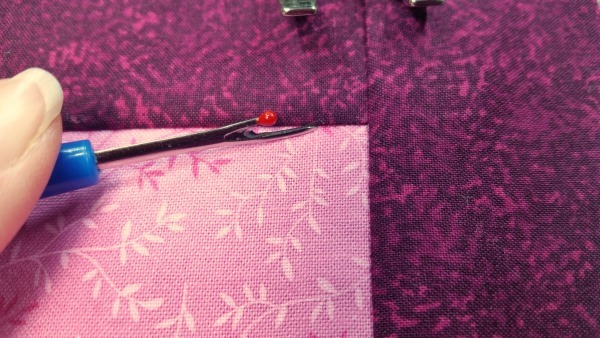 This foot feeds both the top and bottom layers of fabric through the sewing machine at the same time, helping to ensure that your quilt layers don’t shift and give you puckers on the back of your quilt. Set your stitch lengh at 2.5. Your stitches don’t need to be as tight as they do when you piece the quilt together. We will be doing straight stiching, ¼” inch from the seams between the strips. 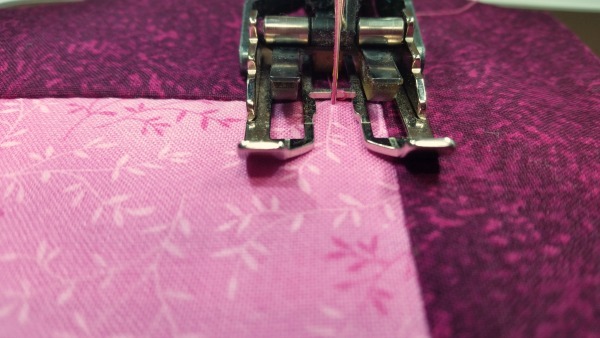 Put your needle into your quilt in the ditch between the long border of your quilt and your first strip and ¼” away from the short border seam. In the photo below, I’ve put the tip of my seam ripper right in the ditch. 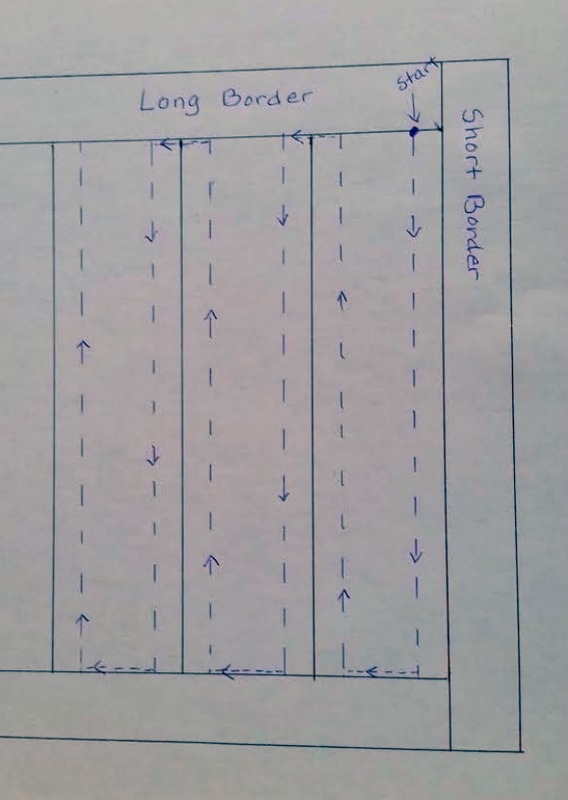 If you look closely, you’ll notice that the border side of the ditch is slightly puffier than the strip side of the ditch. This is because I have pressed my seams towards the borders. The ditch is right on the seam on the non-puffy side. In the photo below, I’ve put my needle right in the spot I pointed at with my seam ripper. Take 4 or 5 securing stitches with a stitch length of 0, then sew a straight line exactly ¼” from the seam. Remember, straight seams here will look better than crooked seams. When you get to the end of the row, turn the quilt so that you can sew in the ditch until you are ¼” away from the next seam. Look at the diagram below. You’ll notice that once I start sewing, I never have to break my thread until I get to the very end. 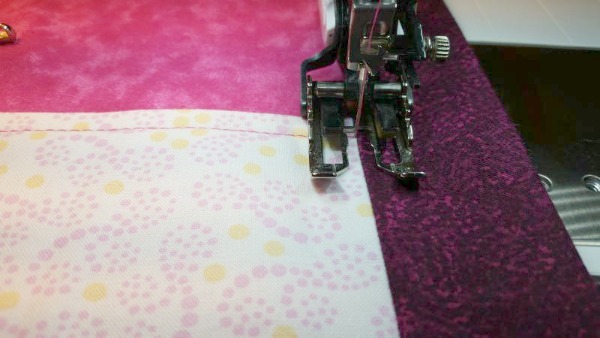 Just sew in the direction of the arrows, remembering to stitch in the ditch when you reach the end of each row. If you get your stitches in the ditch, they are very difficult to see. The photo below shows stitching in the ditch that is both successful and unsuccessful. The stitches on the left are not in the ditch, but have sneaked onto the border. You can see them, and they are supposed to be invisible. The stitches on the right, however, are invisible because they are nestled into the ditch. After you have stitched ¼” from all the seams between the strips, it’s time to quilt the border. 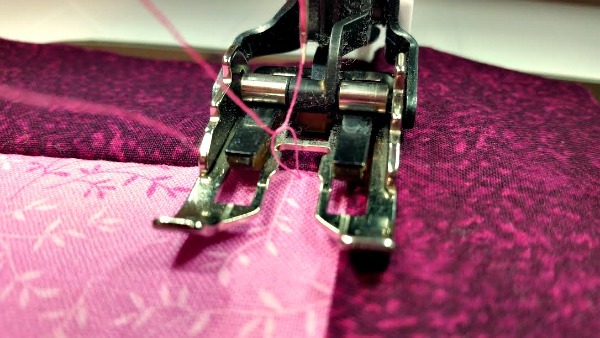 If you have any decorative stitches on your machine, you may want to use one on the border. My machine has a stitch that reminds me of hearts, so I stitched it ¼” from the seam. 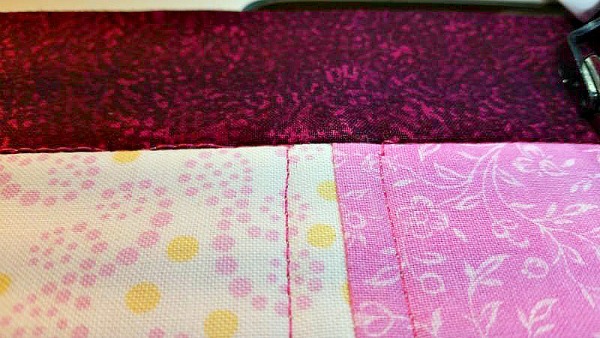 I started at one edge of the border, sewed a few 0-length securing stitches, and then sewed to the other end. I didn’t worry about where my stitching lines crossed each other on the corners. Be sure to add securing stitches at the end of each line of stitching. The photo below shows the entire quilt top. 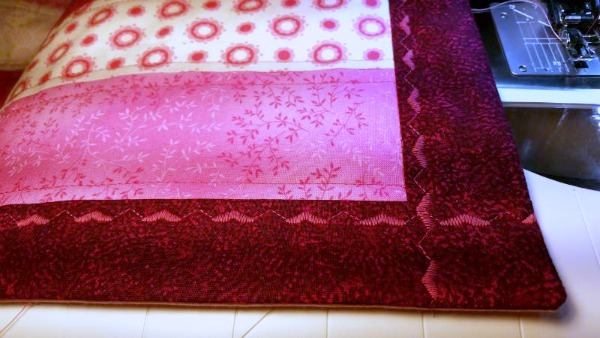 I have quilted ¼” from every seam between the strips and between the strips and the short borders. Any I love the decorative stitch in the border. I decided my happy Valentine’s Day quilt needed some heart-shaped buttons. (I happen to love buttons.) I couldn’t put them in the center of the table runner because I plan to put a vase and flowers in the center, so all the buttons are on the outside edges of the quilt. 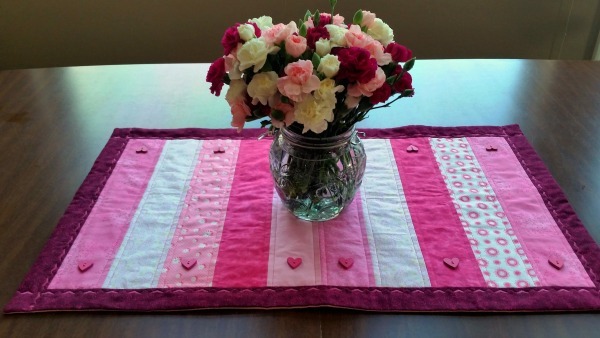 I love my Valentine’s Day table runner. It’s the perfect size for my kitchen table and is a nice accent for a simple vase of carnations. I’d love to see photos of your table runners or answer any question. Just post either in the comments. And I want to know if your table runners inspired your loved ones to buy you chocolate. 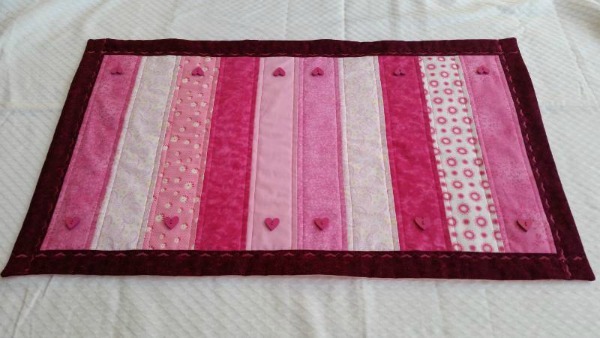 Next week, I will show you a simple variation on this table runner along with another easy, straight-line quilting technique. Absolutely beautiful, Jennifer. Thanks for sharing. God bless. Thanks, Marilyn. It really is darling. It’s all my sister’s doing, but I’m tempted to try one for myself. The table runner is so beautiful Jennifer. I wish I had talents for something like this. My husband won’t even let me sew a button on a shirt. He does it. Keep up your wonderful writing. Thanks, Cheryl! I’m very good at sewing straight lines and that’s about it. 🙂 My sister is a pro.